Content on Cancer.Net is approved by the Cancer.Net Editorial Board, composed of more than 150 medical, surgical, radiation, and pediatric oncologists, oncology nurses, physician assistants, social workers, and patient advocates. The Cancer.Net Editors Meeting was held on October 31, 2018. 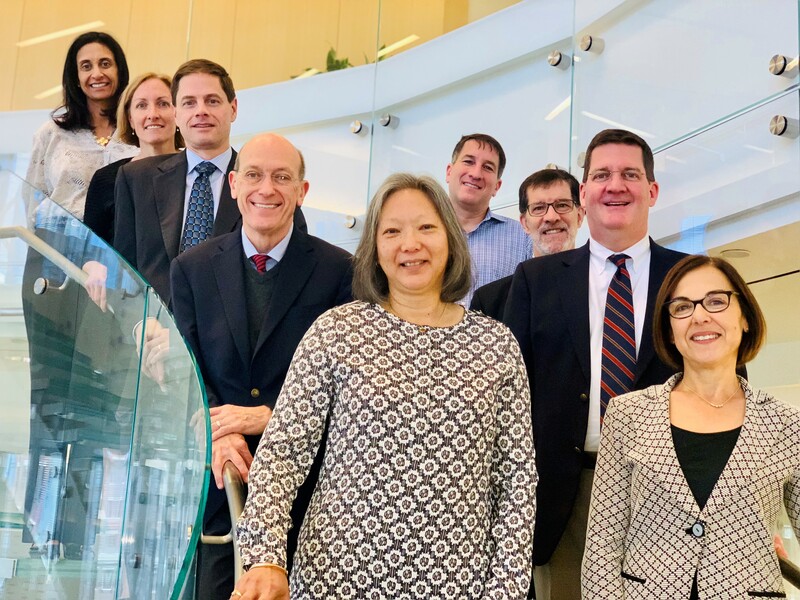 Editor in Chief Lidia Schapira, MD, FASCO, and the site’s Associate Editors reviewed additions and updates to Cancer.Net over the past year, set the 2019 goals for ASCO’s patient education program, and provided expert guidance to ensure that Cancer.Net’s content is comprehensive, credible, current, and accessible for people with cancer. Bottom row from left are Susan Chang, MD (Central Nervous System Tumors), Lidia Schapira, MD, FASCO, Editor in Chief. Next row up, from left are Michael Williams, MD, ScM (Lymphoma), Jeffrey Meyerhardt, MD, MPH (Gastrointestinal Cancer), Charles Loprinzi, MD, FASCO (Psychosocial Oncology), and Daniel A. Mulrooney, MD, MS (Pediatric Cancers). Next row up is, Brian Rini, MD (Genitourinary Cancer). Next row up is, Norah Lynn Henry, MD, PhD, FASCO (Breast Cancer). Next row up is, Jyoti Patel, MD (Lung Cancer). Not Pictured: Ezra Cohen, MD, FRCPC (Head and Neck Cancer), Jonathan Berek, MD, MMS, FASCO (Gynecologic Cancer), Ryan Sullivan, MD (Melanoma and Skin Cancer), Shelby Terstriep, MD (Community Oncology), Vicki L. Keedy, MD (Sarcoma), Michael Thompson, MD, PhD, FASCO (Myeloma), and Guillermo Garcia-Manero, MD (Leukemia). View more information about Cancer.Net’s Associate Editors, who lead the Cancer.Net Editorial Board. View more information about Cancer.Net’s Specialty Editors, who provide topic-specific expertise as part of the Cancer.Net Editorial Board. View a listing of Cancer.Net’s full advisory panel, which reviews content as part of the Cancer.Net Editorial Board.